Castaway to an island of clear waters and golden sands, wild cliff paths and tended gardens, cosy Inns and fine dining, pretty cottages and country-style hotel luxury and a history rich in smugglers' spoils and Prussian princes. 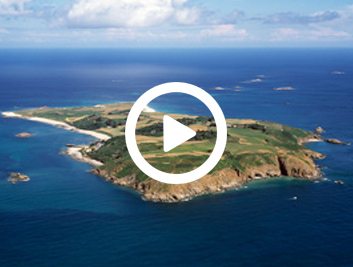 In this little pocket of the Channel Islands you will discover a unique holiday destination with a landscape as diverse as its history. Video by Steve Bougourd (Guernsey Zoo). 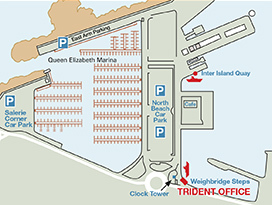 For further information on Travel Trident services including full details of terms and conditions of transportation, both passenger and cargo please visit the Travel Trident ticket office or call 01481 721 379. 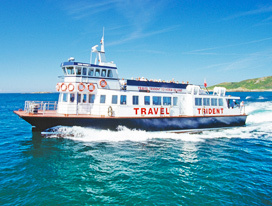 Herm Island is just 20 minutes away by frequent "Travel Trident" ferry from St Peter Port in Guernsey. Safe, clean, pollution free, no cars, no crowds, no stress, Trident offer the official ferry service between the islands operating 364 days a year.